An award-winning author’s stirring quest to find and understand an elusive and exceptionally rare species in the heart of Southeast Asia’s jungles. In 1992, in a remote mountain range, a team of scientists discovered the remains of an unusual animal with beautiful long horns. It turned out to be a living species new to western science-a saola, the first large land mammal discovered in 50 years. 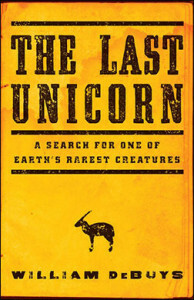 In the tradition of Bruce Chatwin, Colin Thubron, and Peter Matthiessen, THE LAST UNICORN is deBuys’s look deep into one of the world’s most remote places. As in the pursuit of the unicorn, the journey ultimately becomes a quest for the essence of wildness in nature, and an encounter with beauty.